With plans and hopes to get at least one licensed childcare facility in Newton County, the Newton County Childcare Initiative gave a presentation to the Newton County Council for its proposed Goodland facility. The Newton County Childcare Initiative would like to convert two classrooms in the Goodland Community Center for licensed childcare and have Right Steps Child Development Center operate the facility. The facility would have one classroom for eight children with ages ranging from infant to two years old. The other classroom could accommodate 20 children ages 3-5. According to a budget submitted by Right Steps, to make the facility and their operating plan work they would need a one time set up cost of $46,482 and the first year’s operating budget of $371,800 with the majority of that being salaries. Council member Michael Mark asked if they are looking for funds just to get the program started or are they looking for county funds to subsidize and run the program. “Once the funding starts, when does it stop,” asked Mark? “We know childcare is not a moneymaker or we would have more of them here in Newton County,” answered Gonczy. DeBruyn also added that after the first year, the funds needed would go down as revenue would increase but they would still need to secure around $185,000 in funding for the second year. When asked what the goals were for The Newton County Childcare Initiative, Gonczy said that the big thing for them is to get a licensed childcare facility in the county to set up future funding in the form of vouchers and grants. “I am completely in favor of this project, but not for the government to subsidize it forever,” said Mark. Right Steps stated that they would use a sliding fee scale based on income to determine charges. According to their 2017 sliding fee, parents could be charged anywhere from $90 a week to $280 a week. 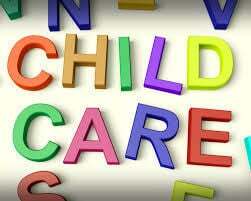 The hourly rate for childcare was $9, while the daily rate ranged from $44 to $56. DeBruyn added that the sliding fee scale for Goodland would most likely be at lower rates.